Taste test: These kettle-cooked barbecue chips were decent but far from great. The barbecue flavor was OK and nothing special, and I didn't taste any honey. The crunch was pretty good, but overall just a good chip, not one I'd go out of my way to obtain. Smell test: Sort of strange, but not awful. 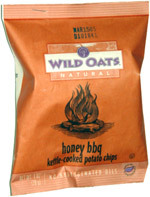 This snack was discovered by Amitai at Wild Oats Market, Princeton, New Jersey. Review published .